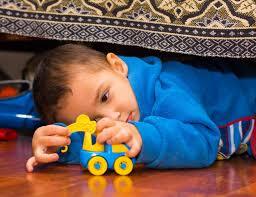 Early warning signs of autism usually emerge before a child turns three. These symptoms can start as early as 12 to 18 months for some, while other kids may not show signs until they are in second or third grade. However, many of these signs are so subtle that parents often overlook them or mistaken them as normal phase of child development. So, what are these symptoms that parents should be aware of? Here are five signs to look out for to help with early diagnosis and treatment of a child with autism spectrum disorder (ASD). Poor eye contact is said to be one of the hallmarks of ASD. It is common among younger kids to lock eyes with people, but children with autism usually avoid eye contact—or do not look at people directly or doing so fleetingly or inconsistently. However, do not rely on this sign alone as some kids could just be shy. Repetitive gestures or motions, such as flapping hands, rocking back and forth or flicking fingers, are also warning signs of autism that many parents commonly overlook. Especially if your child does these actions when he’s excited or worked up, that is something to look into. ASD can also cause a child to be extra sensitive. He may enjoy touching soft or smooth surfaces, but doesn’t like to be cuddled. Also, everyday noises and sounds can be annoying for them. Noises from the vacuum cleaner or toilet flush can be irritating to them. You will know this if you see them holding their hands to their ears. Kids with ASD may also lack in pretend skills. They do not use objects to pretend—such as picking up a remote to use as microphone or a comb to use as phone. 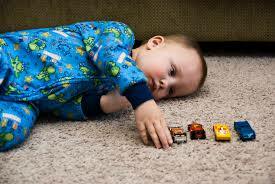 If such pretend play does not happen by 18 months, see it as an ASD warning sign. When a child turns one, they can often respond when someone calls them by name. If they can’t, that can be a sign of ASD. Kids with autism may not hear people or may struggle to follow or understand simple instructions and commands. This is probably the most obvious sign, but may take some time before you realize the possibility of ASD. 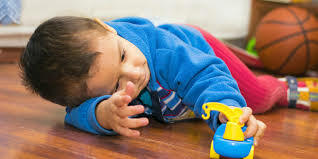 If you see signs of a child wanting to play with the same toy and playing with it in the same manner for hours or spend a lot of time arranging his toys in a specific order, it’s a red flag. If you see a combination of these signs to your child, let your child’s doctor know about it. If your child really has ASD, know that early diagnosis leads to more effective treatment. This entry was posted on Wednesday, February 6th, 2019 at 7:22 am by Editor	and is filed under Uncategorized. You can follow any responses to this entry through the RSS 2.0 feed. You can skip to the end and leave a response. Pinging is currently not allowed.